We have been harvesting tomatoes this last week, one of my favorite foods to can. I enlisted the help of my daughters for making the salsa, they were excited to help! I love that they want to learn how to can, it was never that thrilling for them, when they were younger. The Roma tomatoes were used for the salsa and whatever else I had was used for stewed tomatoes (I added green pepper and onion). If I can get my hands on more tomatoes, we are going to put up more salsa, it never last long in this house. Hello Sandra, wow your fresh salsa looks so good. I bet it tastes so delicious too. Thanks for visiting my blog and leaving the sweet comment on the knit phone case I made. I use my boiler canner pot, and have to add the lemon juice. I need to invest in a pressure canner. Maybe next year. Thanks for the recipes. Thank you for the salsa recipe, Sandra. I'm always looking for new recipes and this one sounds like a great one to try. Have a great day! We love salsa and trying our new recipes is so fun. Yours looks great, I can't wait to try it. Thank you for sharing. Thank you! I am hoping to be able to try one or two more recipes this year. Sounds wonderful! It's always a little sad to see the end of tomato season. 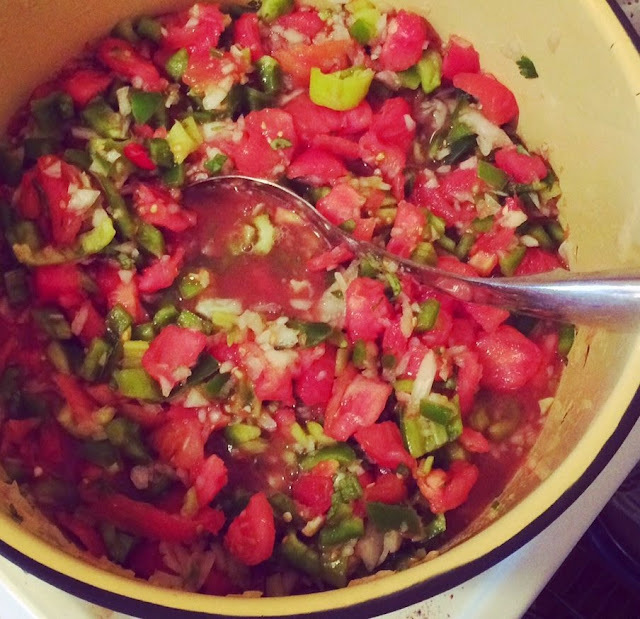 Oh, homemade salsa is the best! Yours looks delicious and how cool is it to be able to do that with your kids helping.